A Florida law that may protect the man who shot and killed 17-year-old Trayvon Martin in February is the template for an American Legislative Exchange Council (ALEC) "model bill" that has been pushed in other states. 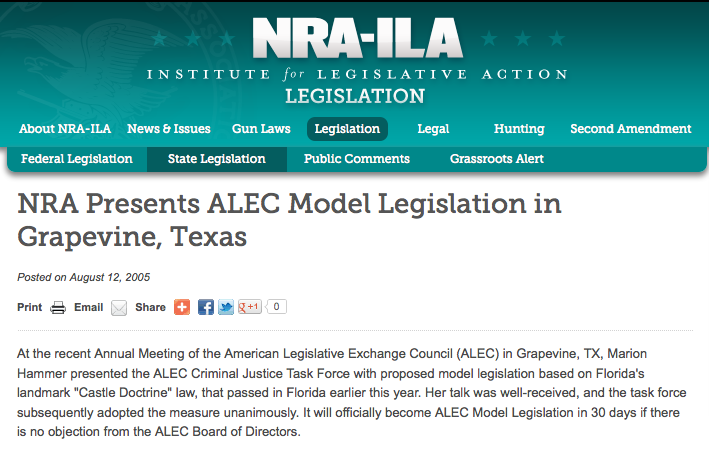 The bill was brought to ALEC by the National Rifle Association (NRA), and fits into a pattern of ALEC bills that disproportionately impact communities of color. Florida's "stand your ground," or "castle doctrine," law could prevent the prosecution of George Zimmerman, the 28-year-old "neighborhood watch" vigilante who shot the unarmed Martin as the teen returned from a trip to 7-11 with an iced tea and a pack of Skittles. The law, also pushed by its supporters under the name the "Castle Doctrine," changes state criminal justice and civil law codes by giving legal immunity to a person who uses "deadly force if he or she reasonably believes it is necessary to do so to prevent death or great bodily harm to himself or herself or another or to prevent the commission of a forcible felony." It also bars the deceased's family from bringing a civil suit. Evidence suggests a major reason Zimmerman thought he needed to use deadly force against the unarmed Martin is because the teen was black -- on the recording of Zimmerman's call to 911 (which he made before pursuing the teen), he is heard using what sounds like a racial epithet and saying "he's a black male...Something's wrong with him...These a**holes, they always get away." Zimmerman has not been charged with any crime. As Media Matters reported earlier, Florida's "stand your ground" law is nearly identical to the ALEC Castle Doctrine Act. (3) A person who is not engaged in an unlawful activity and who is attacked in any other place where he or she has a right to be has no duty to retreat and has the right to stand his or her ground and meet force with force, including deadly force if he or she reasonably believes it is necessary to do so to prevent death or great bodily harm to himself or herself or another, or to prevent the commission of a forcible felony. ALEC is the corporate-funded organization that allows global corporations like Wal-Mart and ideological special interests like the NRA to hand state legislators changes to the laws they desire. ALEC “model bills” have served as the template for voter ID laws that swept the country in 2011, for the “voucher” programs that privatize education, for anti-environmental deregulatory bills, and for the wave of anti-union legislation in Wisconsin, Ohio, and Indiana. The NRA and its lobbyist Marion Hammer helped draft the "stand your ground" law and first pushed it in Florida. Florida Senator Durell Peaden, an ALEC member, introduced the law in his state and it passed in early 2005 as the NRA's Hammer reportedly "stared down legislators as they voted." 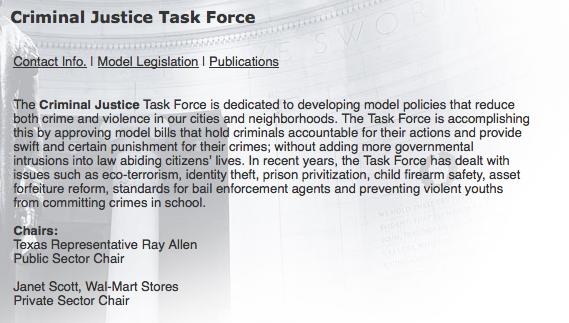 After Governor Jeb Bush signed it into law, Hammer presented the bill to ALEC's Criminal Justice Task Force (now known as the Public Safety and Elections Task Force) months later. As the Center for Media and Democracy has uncovered, the NRA boasted that "[h]er talk was well-received," and the corporations and state legislators on the Task Force voted unanimously to approve the bill as an ALEC model. As CMD and Common Cause have noted, ALEC Task Force meetings are closed to the press and public, but corporations and ideological special interests or trade groups like the NRA vote as equals with elected officials. 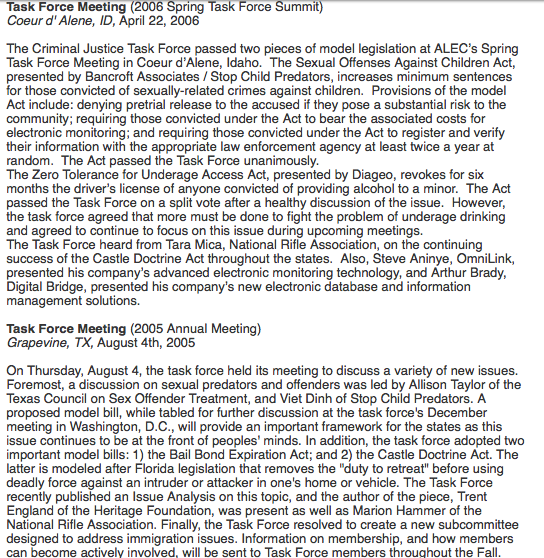 At the time, as CMD has documented, Wal-Mart was the corporate co-chair of the Task Force (see the screenshot here). Since becoming an ALEC model, 16 states have passed laws that contain provisions identical or similar to the ALEC "Castle Doctrine Act." In 2007 it was passed in four states and highlighted by ALEC on their "legislative scorecard," as discovered by Common Cause. In 2011, controversial governor and ALEC alum Scott Walker signed into law in Wisconsin a Castle Doctrine bill that echoes the ALEC bill in key elements. On March 3 of this year, 20-year-old college student Bo Morrison was shot and killed by a homeowner in Slinger, Wisconsin as the young man hid from police after attending an underage drinking party. Because of the Castle Doctrine, no charges will be filed in the shooting. Like Trayvon Martin, Bo Morrison was black. "The 'Stand Your Ground' law is a license to kill," former U.S. attorney Kendall Coffey told NBC News, noting that the number of "justifiable homicides" in Florida has tripled since the law was passed in 2005. The Castle Doctrine and its "stand your ground" provisions give license for people to engage in vigilantism without liability. As such, the ALEC bill can put the decision to take a life in the hands of a person whose fears are motivated by prejudice and racial bias. The law establishes a presumption that a person acted in self-defense if a killer claims they had a reasonable fear of bodily harm, but in situations like the killing of Trayvon Martin, where there were few eyewitnesses other than the alleged killer and the person who is killed, the presumption of immunity can be very difficult to rebut. In those circumstances, unfounded fear based on racial prejudice that leads to murder could end up being protected under the law. If the ALEC "Castle Doctrine Act" opens the door for racial bias to be protected under the criminal justice system, the ALEC model "Voter ID Act" may sanction racial prejudice in the electoral system. The ALEC "Voter ID Act" would require voters show only certain kinds of photo IDs at the polls, which could potentially disenfranchise millions of people who do not have the required photo ID but who have proof of identity and residency -- primarily people of color, the poor, and the elderly. A study from the Brennan Center found approximately 5 million people nationally do not have the state-issued IDs that the new laws require to vote. In Wisconsin, around 220,000 eligible voters lack ID, with around half of all African-Americans and Latinos and a quarter of all elderly citizens not having a driver's license. "The heart of the modern block the vote campaign is a wave of restrictive government-issued photo identification requirements," states a December report from the NAACP. "In a coordinated effort, legislators in thirty-four states introduced bills imposing such requirements. Many of these bills were modeled on legislation," the report notes, approved by corporations and politicians through the "American Legislative Exchange Council (ALEC)—a conservative advocacy group whose founder explained: 'our leverage in the elections quite candidly goes up as the voting populace goes down.'" While some ALEC bills disproportionately affect communities of color, it may be little surprise that African-Americans and Latinos are mostly absent at ALEC meetings. The 2011 ALEC meeting in New Orleans was overwhelmingly white based on the observations of those attending. But the lack of representation is striking for an organization purportedly concerned with giving a voice to those affected by government action. After the Center for Media and Democracy analyzed and made available over 800 previously-secret ALEC "model bills" in July, ALEC's National Chair, Louisiana Rep. Noble Ellington, spoke with NPR's Terry Gross about the organization. Gross asked Ellington, "Why give corporations such a big say in drafting legislation?" Ellington replied, "Well, partly because they're one of the ones who will be affected by it." While corporations may have had a say in drafting legislation, people representing populations most affected by ALEC model bills -- like communities of color -- were not in the closed-door meetings where politicians vote as equals with lobbyists. But some are raising their voices -- Color of Change has launched a campaign encouraging corporations that rely on business from African-Americans to stop funding the American Legislative Exchange Council (ALEC) through corporate membership dues. The Color of Change ALEC petition is available here. The group's petition demanding justice for Trayvon Martin is available here. CMD's Executive Director Lisa Graves and Nick Surgey of Common Cause contributed research to this article. Please note the additional file attachments below. * This article was updated with the March 27 Media Matters report, where Hammer admitted to helping draft the law. Zimmerman should still be liable for this murder. Look at this ALEC-like law. "A person who is not engaged in an unlawful activity and who is attacked ..." Is there a plausible story where the shooter can persuade a jury that he was being attacked? This seems to be the lynchpin of the castle doctrine. If he yelled at the boy to identify himself and Trayvon fled in fear (and was he shot in the back?) then this circumstance would NOT satisfy the law. Of course, the shooter is going to try to fabricate a story of attack, but assuming that Trayvon has no record of violence and is otherwise known as a model student, then that story probably wouldn't stand up under scrutiny. Don't give up yet on justice being done, though it won't bring Trayvon back. BJD wrote: ”...Of course, the shooter is going to try to fabricate a story of attack, but assuming that Trayvon has no record of violence and is otherwise known as a model student, then that story probably wouldn't stand up under scrutiny...” Unfortunately, in today’s renewed atmosphere of racism and distrust of the “other,” I’m afraid that even if “the story probably won’t stand up under scrutiny,” Zimmerman will probably still get off scott free. If NRA/Tea Party types can get away with carrying (apparently loaded) guns into a public meeting with the President, ANYTHING could happen. Ignorance and bigotry have no limits - especially if they are reenforced by people and/or organizations that stand to gain by keeping a significant proportion of the population ignorant and bigoted. Apparently at least 25% of all voters STILL believe that Obama isn’t an American citizen - and that he is Moslem. I wish it were otherwise (and I’m working to make it so), but we seem to be at a major tipping-point in continuing the American constitutional system - including protection of First, Fourth, and Fifth Amendment rights. The growth of bigotry and ignorance has been accelerated by use of online “sources,” Fox News, and Big Corporations - who are revelling in their new status as “people” thanks to the evil “People United” Supreme Court decision. It has already been determined that the NRA sponsored Castle Doctrine does not apply to this case. This is a very inflammatory article. This was premeditated murder. Now all we have to do is get the district attorney to actually charge Zimmerman with the crime and arrest him. Since when, and by whom? please give specifics. You mentioned the First, Fourth and Fifth Amendments but forgot the Second Amendment which is just as important. As I said in my first post. Zimmerman should be prosecuted for instigating the confrontation. What he did does not constitute a "stand your ground" scenario which I firmly believe in. I can't imagine this kid presented a real threat. Even if he rushed Zimmerman, Zimmerman could have shot him somewhere besides the chest. From all reports it sounds like Zimmerman was a trigger happy hot head. I firmly believe in the castle doctrine law, but it should not apply in this case. Zimmerman initiated the contact with the teen. Too often police, security guards and wannabe versions of both assume a person is up to no good because of looks, color, or any bias they choose. These people should be held to a higher standard. If the facts turn out to be as they look now then Zimmerman should get the death penalty to set an example. If you use deadly force and it is not warranted you will pay the price. This wouldn't be 1st degree, I don't believe. Premeditation is a necessary element. However he should be tried for 2nd degree which should earn him many years of free hots and flops. Zimmerman left his house, with his gun in hand, and followed the kid. That's all the premeditation that's needed. He had thought it through enough to take the gun, and confront someone who was not committing a crime, nor antagonizing anyone. That qualifies as premeditation. The correct if then conclusion is as follows: If Treyvon Martin had avoided conflict with Zimmerman, he would still be alive. I have been confronted by pushy and not so nice members of neighborhood watch groups, both as a high schooler, college student, and a grownup. I have always responded politely because I was in their community. Treyvon martin picked a fight with a man who was on his own turf. That man had a right to question Treyvon Martin's presence. Treyvon Martin apparently chose to escalate when he had no moral high ground to do so. In the resulting fight, which was instigated by Treyvon Martin, a smaller and weaker Zimmerman did the only thing he could do to defend himself against a much bigger Martin and pulled his gun and fired. Zimmerman did not have the luxury of deciding where to shoot Martin, as Martin was on top of him and pummeling him. How fast would Martin have had to run to avoid conflict with Zimmerman? Zimmerman pursued Martin, against the instructions of the police dispatcher. Martin had every bit as much right to "stand his ground" as Zimmerman. He was only trying to get home safely from the store, and here he was, being pursued and confronted by this self-important idiot with a gun. Standing his ground cost him his life. So much for an armed society being a polite society.